Look what came today!!!!! Jesus, Mary and Joseph was I excited to get this package??? Since I’ve only had this palette for about 12 hours, I really shouldn’t have titled this post a ‘review’. It’s more like first impression and swatches. The official full restock date is Wednesday June 7 so I’ll have some time to play and update you guys a bit before then. But in the meantime let’s talk deets! 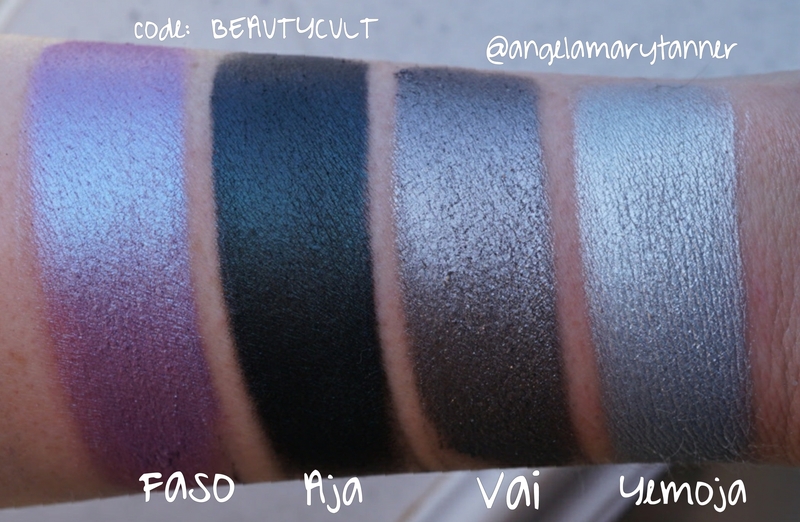 Ladies and gentlemen… we have swatches!! 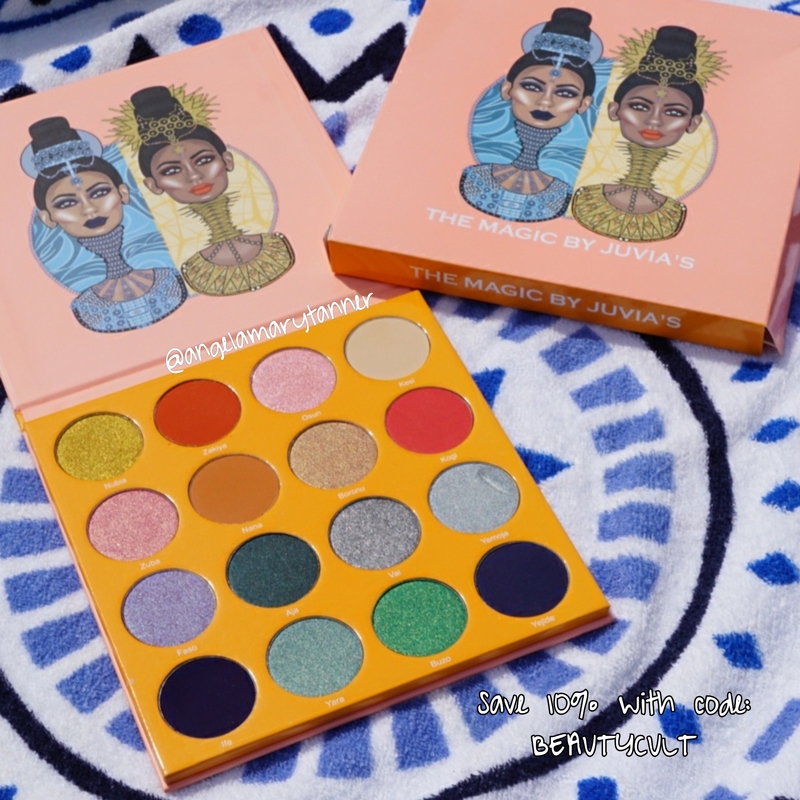 The inspirations for this palette were the Nigerian Osun goddess and the Yemoja goddess (Day and Night time African Goddesses). You can clearly see the inspiration in the warm and cool toned color scheme. The palette has 16 shadows. Each pan is 3.6g/ 0.13oz, which is enormous. 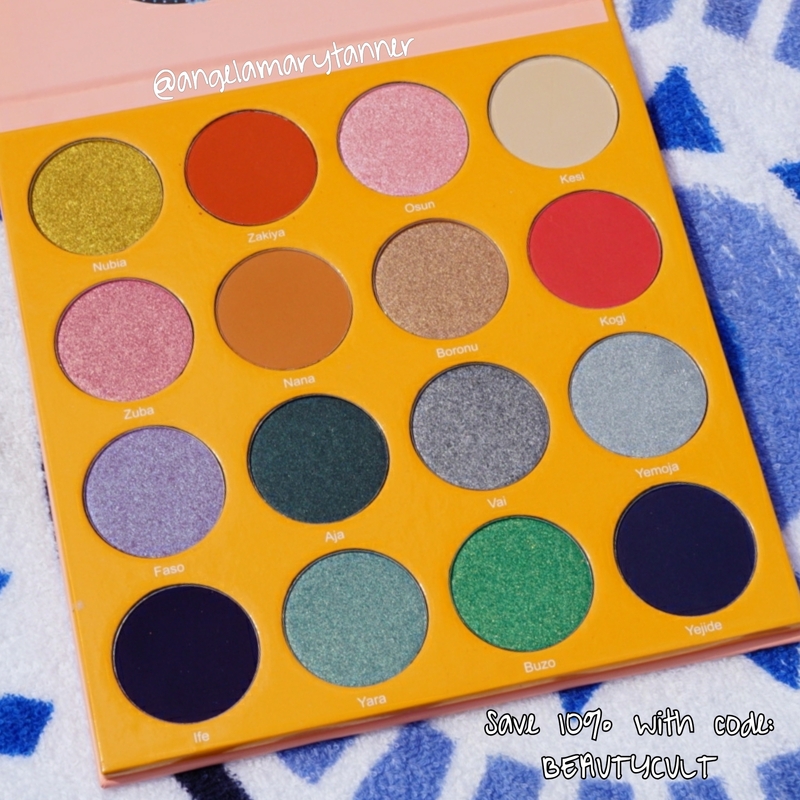 It’s the exact same size as the MASQUERADE palette. Here she is with her siblings for size comparison. All of the shades in this palette are new. There’s a few that look similar to colors in previous palettes but I checked while I was swatching and there’s no exact dupes. There’s 6 mattes and 10 shimmers. Some of the shimmers are foiled finish. There’s also some duochromes, glitters and satins. Alright let’s go through the palette and I’ll introduce you to every shade! 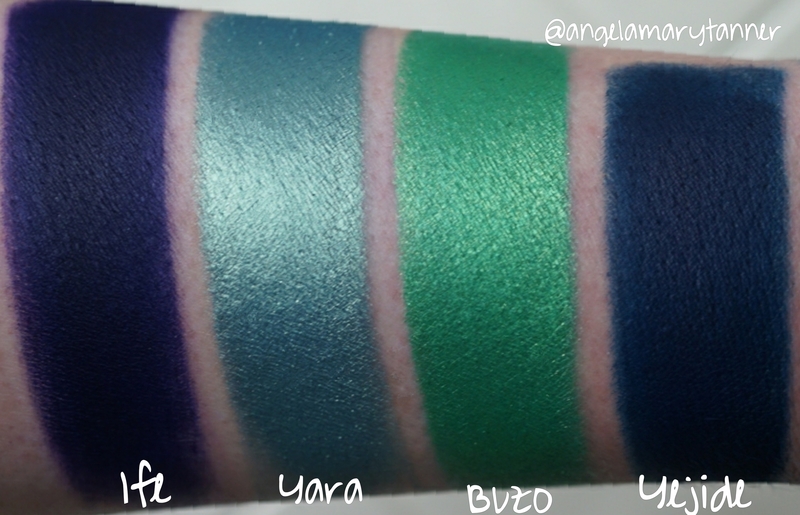 NUBIA is one of the most smooth and pigmented metallics that I’ve used in a long time. We’re talking Natasha denona status. 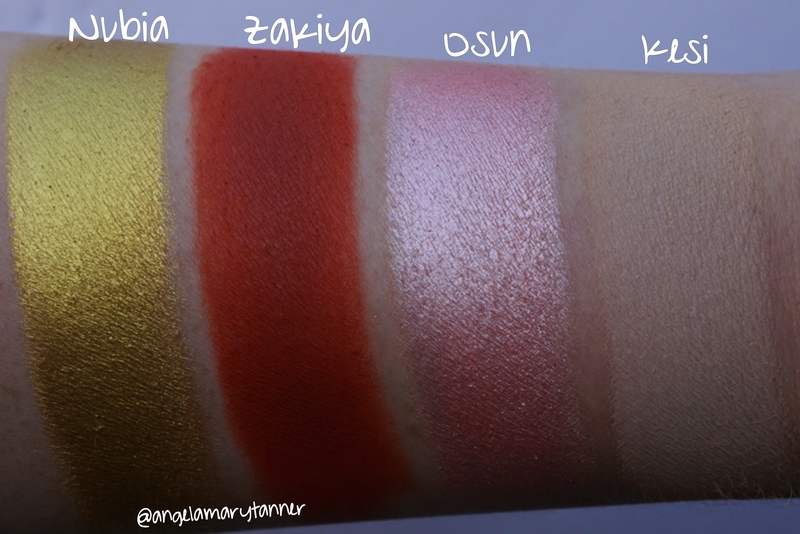 It’s similar to Wodaabe (Saharan palette) but it’s lighter and much brighter. ZAKIYA is a brick red matte. It’s similar to Jamila (Saharan) but it’s brighter and more red. 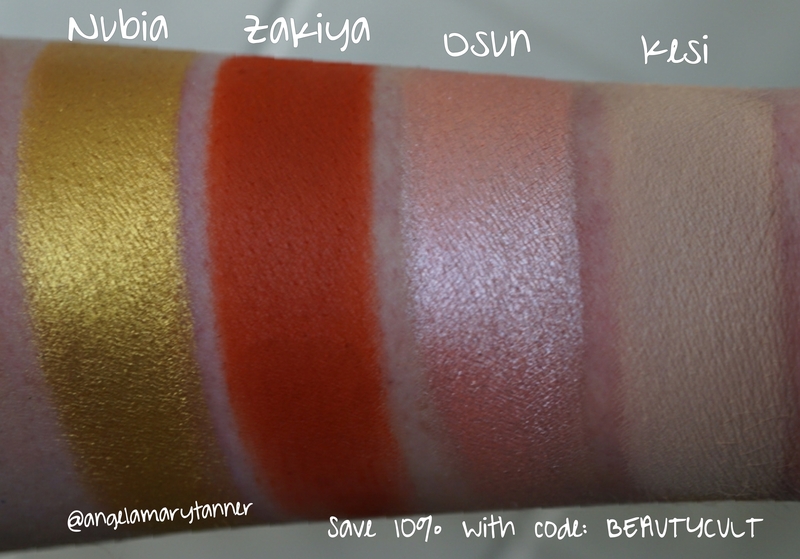 OSUN is bright peachy pink with a foiled finish. It reminds me of one of the shades in the Nicole Guerriero glow kit which makes me think that it’ll be a great highlighter. KESI is light beige matte. 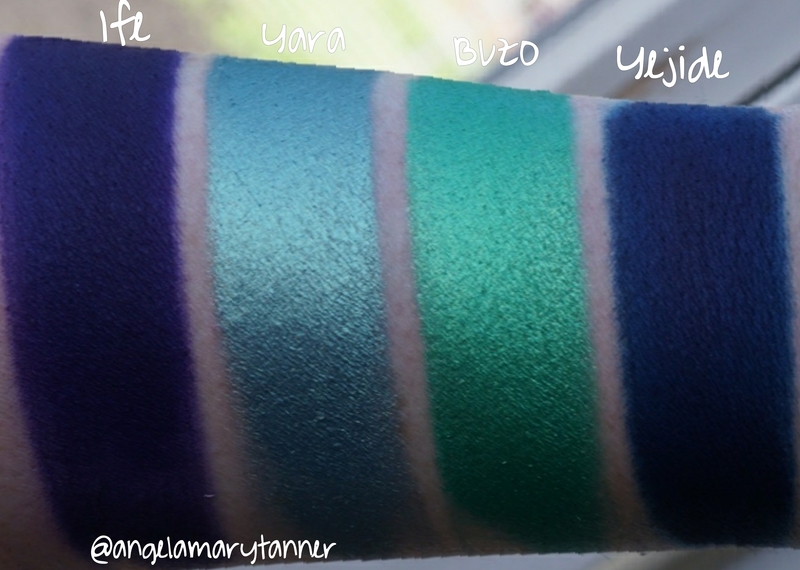 I don’t think any of the other Juvia palettes has a matte highlight/ base shade like this so I’m glad that they finally decided to include one! ZUBA is a pale rose and gold duochrome with a foiled finish. 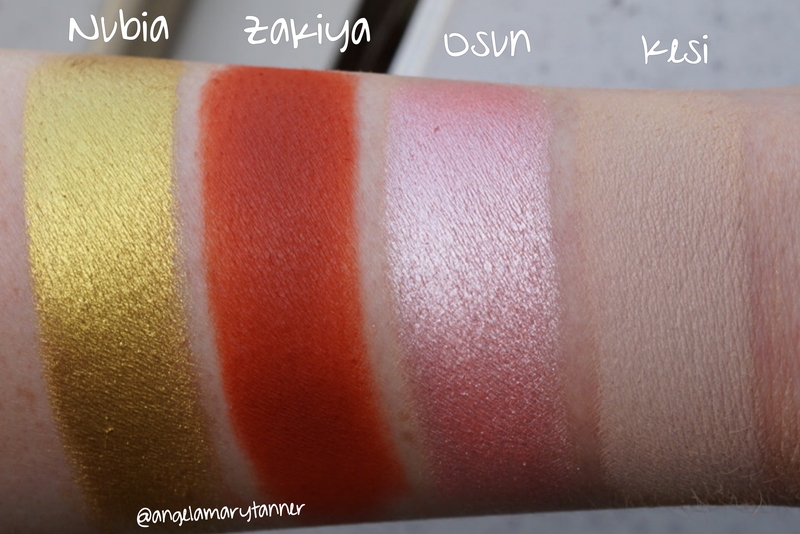 There are two pinky gold duos in the Vol 2 blush palette. One is darker and more vibrant than ZUBA and the other is lighter. 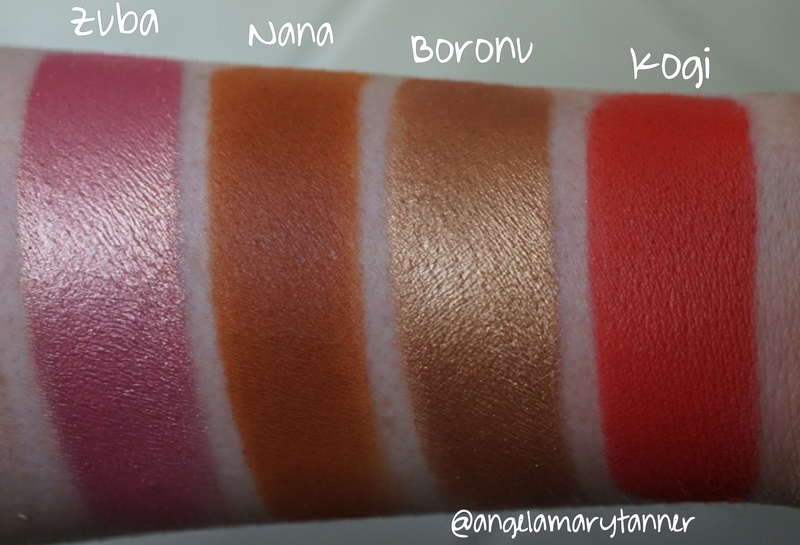 NANA is a light matte brown with heavy orange undertones. 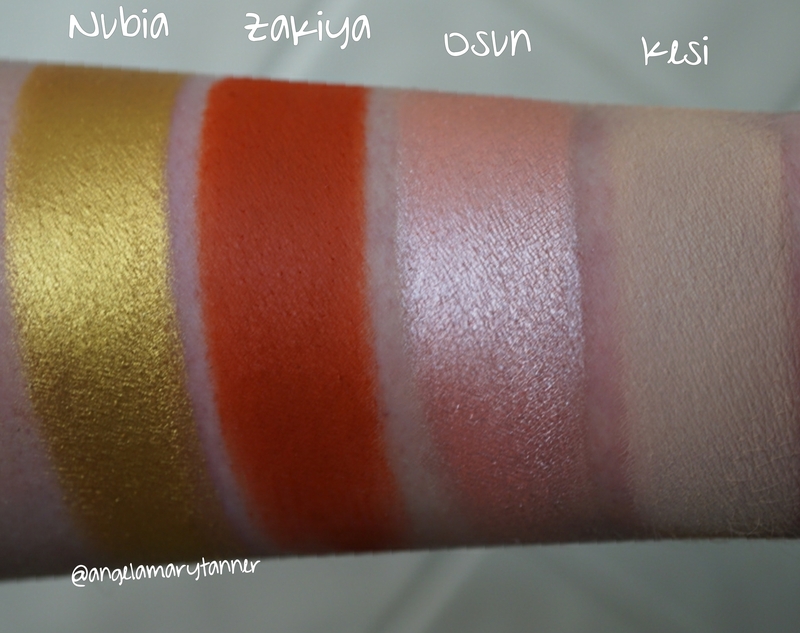 It’s more orange than the light warm browns in the other Juvia palettes. 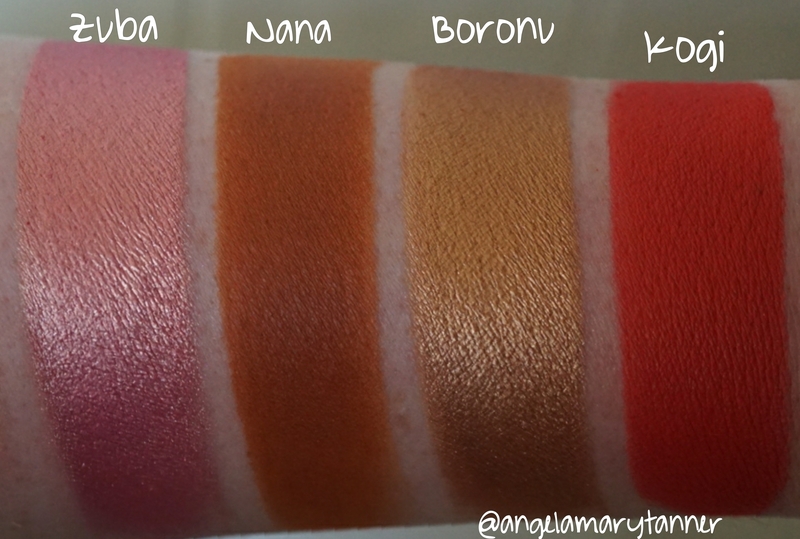 BORONU is a light coppery bronze with peachy gold shimmer. 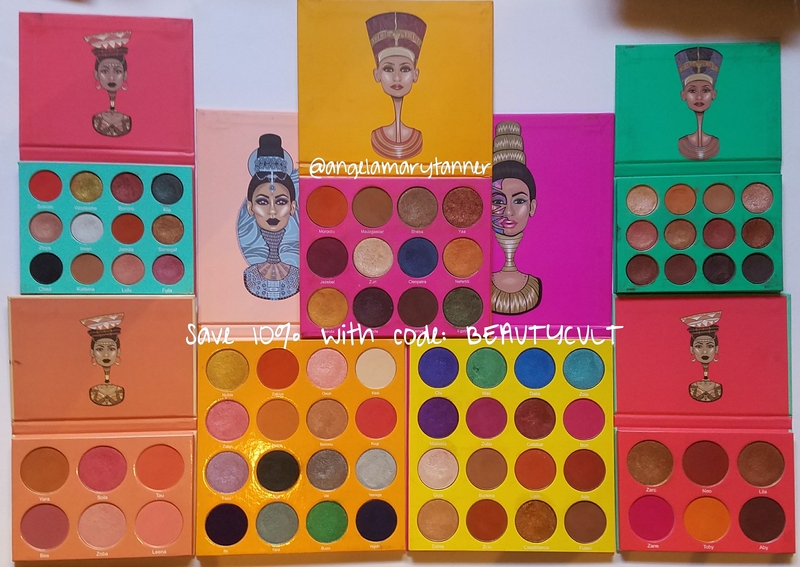 There’s a similar shade in the original nubian palette. KOGI is a vibrant matte coral. It’s in the same family as SOKOTO (Saharan) but it’s much more pink in comparison. SOKOTO pulls more orange. FASO is a light lavender and blue duochrome. 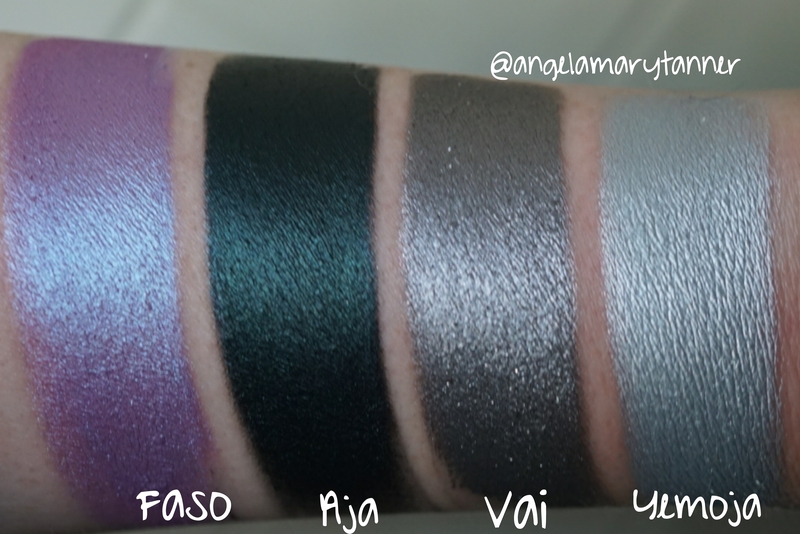 If UD TONIC and MUG BLACKLIGHT were foiled, they’d be dupes for FASO. AJA has a very dense texture with a satin finish. It’s a blackened emerald green. I’d say that KIA (Saharan) is AJA’s first cousin. They both have that deep base/ blue green shift thing going on. But AJA is much darker and primarily green whereas KIA is a teal blue. VAI is a deep silvery taupe with foiled finish and subtle glitter. YEMOJA is a bright silver with blue undertones. IFE is the most intense royal blue matte I’ve ever encountered. It proves to me that there is a God. Seriously it’s amazing. It’s the perfect blend of blue and purple and it’s somehow dark and vibrant at the same time. 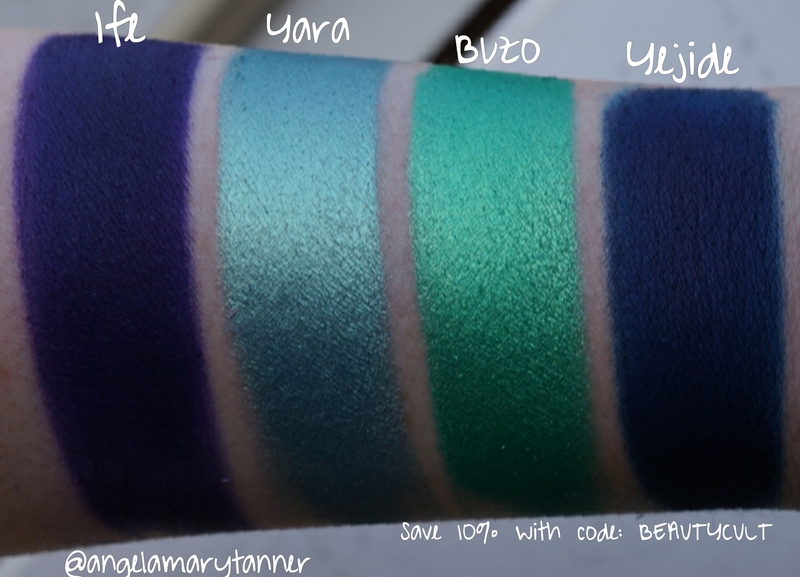 YARA is a smoky blue green with gold shimmer and a foiled finish. BUZO is a bright kelly green with gold shimmer. MALI (masquerade) is lighter and more yellow. YEJIDE is a deep cobalt, almost navy matte blue. And there you have it! 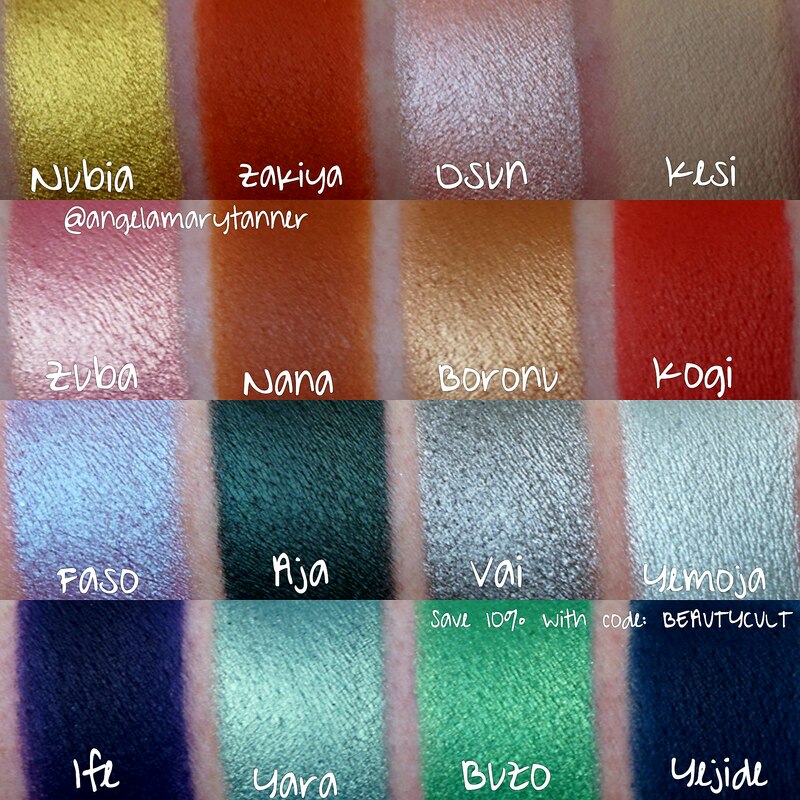 All 16 shades! 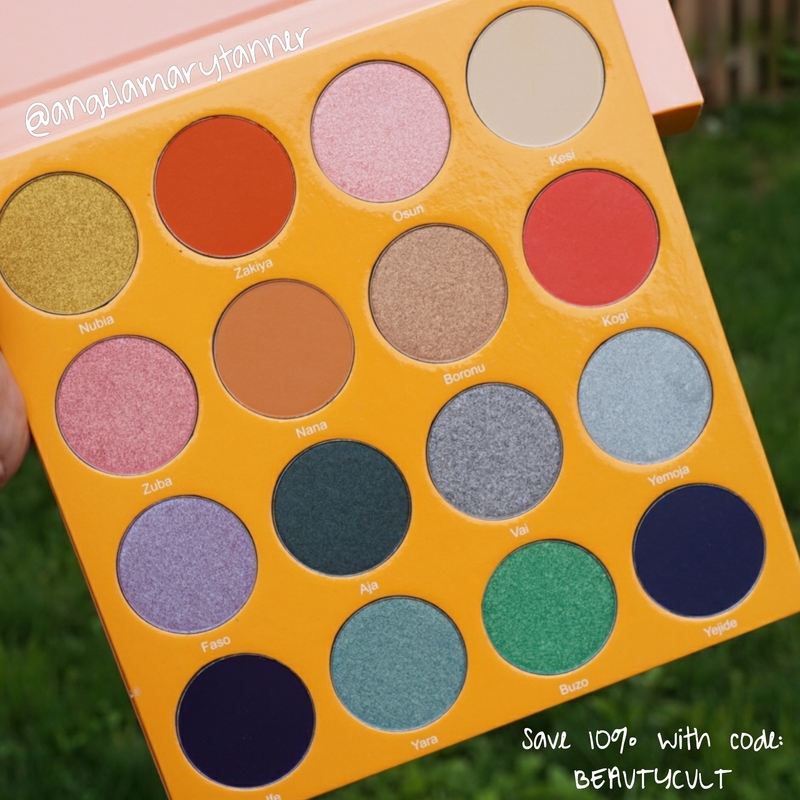 Make sure that you follow @colourpopcult and myself (@angelamarytanner) on instagram because we always try to keep you guys up to date with restocks and sales. THE MAGIC palette officially goes on sale this Wednesday, June 7!